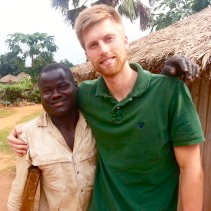 John Steies (Gulu Disabled Persons Union – GDPU): John received his Bachelor’s degree in political science and economics from Minnesota State University. At the time of his fellowship John was pursuing a Master’s of Public Policy degree at the University of Minnesota’s Humphrey School of Public Affairs where he also served as president of the student group Dialogues in International Security and Peace (DISP). After his fellowship, John wrote: "I can’t speak enough about the power of people from different backgrounds, and those thousands and thousands of miles away from one another, coming together to collaborate on such a wonderful and worthwhile cause." Last week at the GDPU offices I met an inspiring young man named Okello Charles.